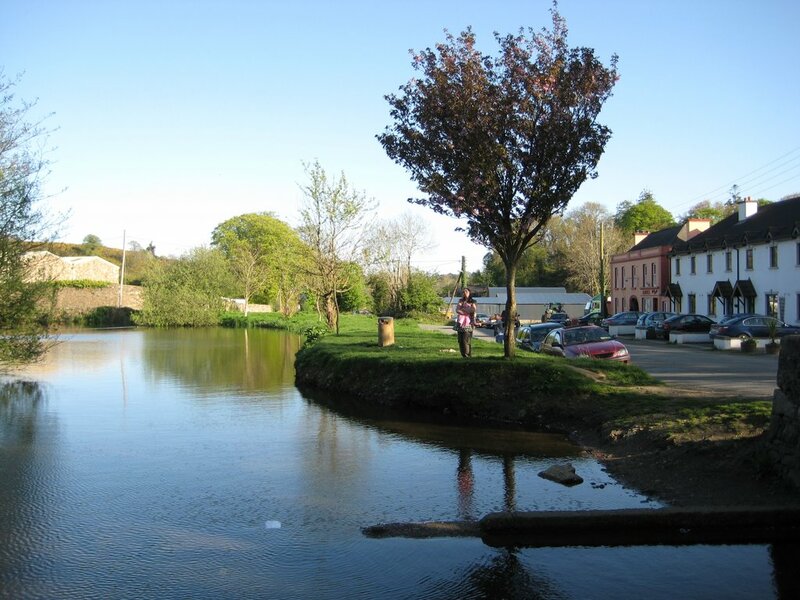 Here is another photo of The Still Pond, Enniscorthy, Co. Wexford. I used to frequently sit on the bank and watch the swans and various ducks as they peacefully glided by. 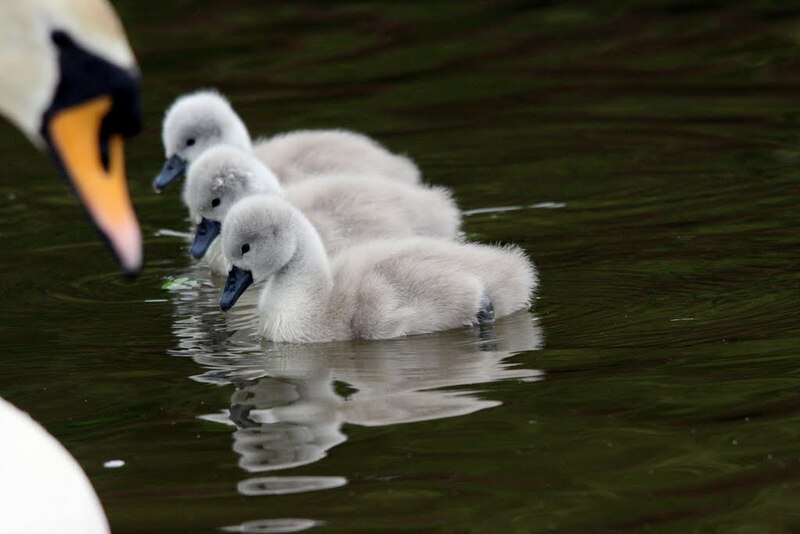 The swans would try to nibble at me sometimes as they vied for space on the tiny bank. Fairfield farm lies to the left – just beyond a bend nearby the bridge – which heads towards Enniscorthy town a mile away. 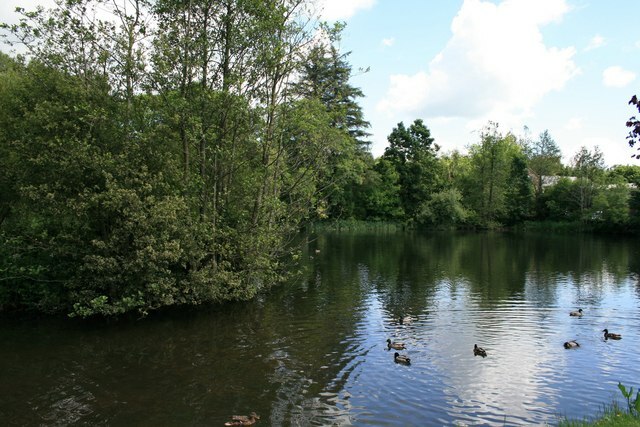 There is a small pond at Fairfield Farm where the ducks rear their young before coming to this pond. The row of white houses were built on property belonging to Doyle’s. Not to be mistaken with Nick Doyle’s (pink) pub next door. Nellie Doyle-Ryan (whose sibling and husband were the most kindness people to (my uncle) and me in my whole life) who passed away last year had lived there. You could not have met a more gentler kinder person in the whole wide world than Nellie. She came from a family of ten and had grown up for some years as a wee child just a stones throw away. Sadly the mother died and Nellie was left with the responsibility of rearing them all. Joan, the youngest baby, basically knew no other mother than Nellie. The father was a policeman and had to go out to work to make ends me. When my uncle returned on holidays to Ireland from Japan, the first place he would head for were the two Doyle’s, Nellie and Helen at The Still. He always had a present for them both, as that is a typical Japanese gesture and he was one to his very core – having spent over forty-five years in Japan. He absolutely adored Nellie to bits and vice versa. She made such a fuss of him. He was so relaxed and at peace in her presence and was able to put his feet up. I think she looked after his domestic needs to the last. Ferns, Co Wexford: Corn field with bales of straw. Courtesy of gregorek. Every week in latter years when I was residing at Fairfield. Joan drove Nellie over from Monageer nearby Ferns to check on the vacant house. She had gone to live with Joan and Mattie in Monageer when she got older and found she could not cope with being on her own in the sprawling house one-stoiried house. Whenever I saw Joan’s car pull up outside the old house I would wander down and join them for the cup of tea. I too loved being in their company, just like my uncle. Nellie always reminisced about her time there with her husband whom she never stopped praising and of whom she missed so much. Nellie married late in life and had no children. She had sacrificed her life to caring for her own. They showed me old newspaper clippings of the floods that came right up to the door of the house. Nellie’s house got more of the brunt of it, than Doyle’s next door. The sandbags obviously didn’t help all that much. I saw all the old rooms in the house and can still have a mental image of them. It was such a shame to see that nobody was living there and keeping it habitable. I remember being told about Ellen Doyle, whom I think worked for a time in Doyle’s pub next door? I vaguely remember being told that she moved into town after her marriage. I’m not exactly sure. There was a beautiful singer in the choir during my time. She was only a young girl, so she stuck out like a sore thumb in an adult choir. Her name was Therese Canavan. I don’t know if she is connected to Martha Doyle or Larry Doyle via marriage. I know there was a reception of sorts in Murphy-Floods, could have been a funeral and the former and the latter were present. 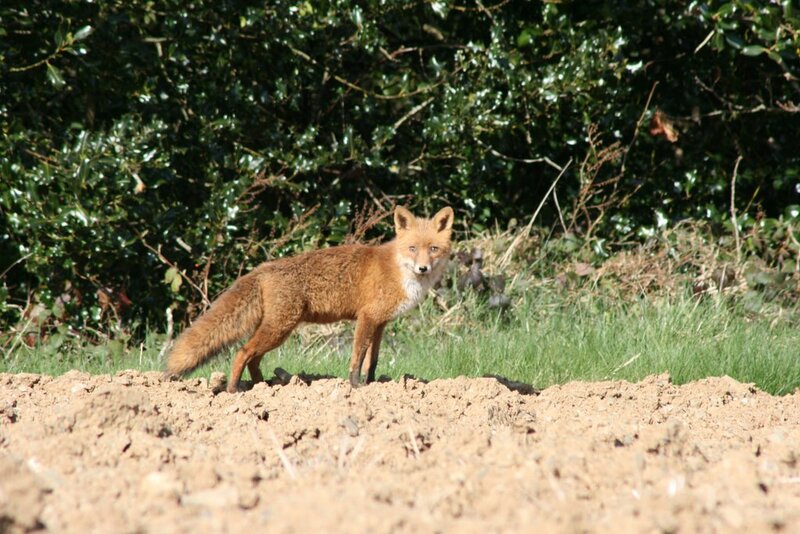 There is also a field called the fox-field at Fairfield Farm. This photo was taken in the vicinity by H/t gregok. It would be unsurprising if it was taken at Fairfield fox-field? An aside. I was looking out the bedroom window the other night, well, it was 2:00am in the morning, and I spotted two young foxes grooming each other and gayly romping around in the garden. It was such a nice sight to behold. ￼￼￼￼￼￼￼￼￼￼￼￼￼￼￼￼￼￼￼￼￼￼￼￼￼￼￼￼The Still Pond, Fairfield, Enniscorthy, Co Wexford. 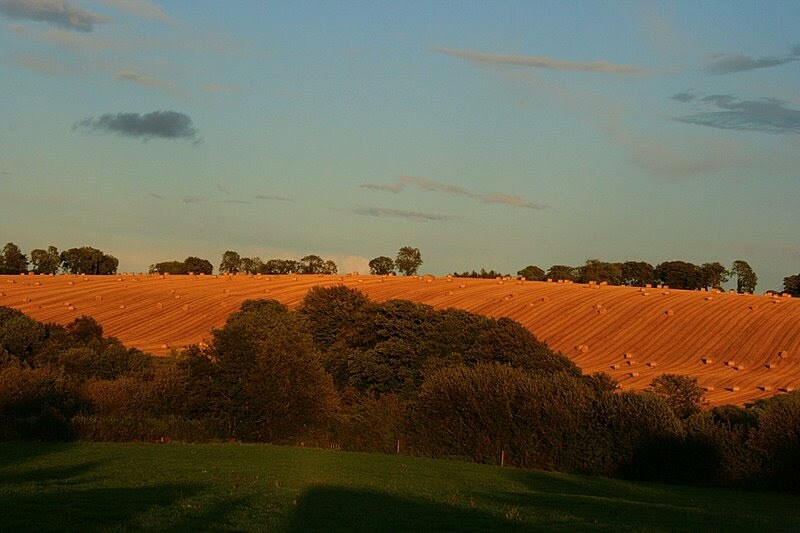 Fairfield Farm lies directly behind large trees in far middle distance. Home of my ancestors for hundreds of years. H/t J. Cassin. You posted this on my birthday. 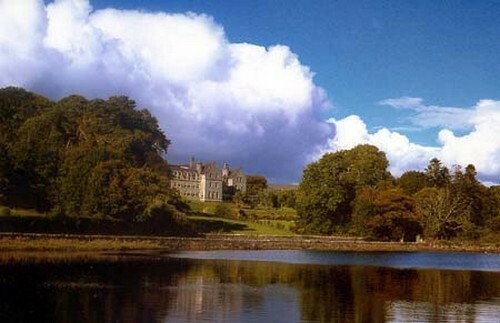 I have traced my ancestors to Fairfield, Enniscorthy, Co. of Wexford, Ireland. My name is Carole Foley Coleman. My grandfather was Stephen Foley born in Fairfield and came with his parents to the US when he was 8 years old in 1901. Is there anything you can tell me about Fairfield. Previously I had found it on a map (in 1995) when I originally tried to go there, but circumstances forced me to stay content here. Now the wanderlust is back. The map I have has turned very faint and my eyes are weaker so that I cannot see exactly where the town of Fairfield is located. Any information you have would be most appreciated. Thank you. Hello Carole Foley-Coleman, I will gather up whatever information I can pertaining to your ancestors home-place. I see from the 1901 Census that there was no Foley family resident at Fairfield or Forgelands in 1901. 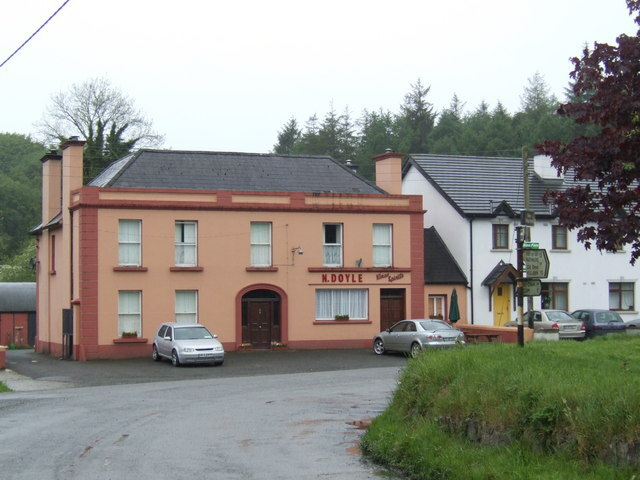 There were, though, Foley’s in Davidstown, which I know ForF came under its auspices in days of yore. I shall root out the family in the census. The townsland of ForF is very tiny. It can’t be much bigger than 200 acres or less in total. Fairfield Farm alone comprises of 110. So it shan’t be that difficult to find out exactly where your family resided. http://preview.tinyurl.com/4fu397c Yeah, Andrew, just a stones throw away there is Monart Spa. Liam Griffin, entrepreneur, hotelier, past Hurling Wexford manager bought Protestant neighbour’s land & built 35 million euro spa. It’s amazingly beautiful. Upon entering panoramic link (see below) click full-screen, then again google map tag to left. See: Forgelands. Here one will get bird’s eye view of mother & kith/ kind’s farm-stead. Monart Spa in Enniscorthy, Ireland Panoramic photo by Tomek Bialek . Click the image to open the interactive version. The historic house of Monart (1740). Wow – Beautiful relaxing scene. I’ve got this beautiful pond photo on my 13 inch Apple dashboard. It’s as clear as daylight. I know this spot like the back of my hand. I’ve oftentimes sat on the pond’s edge & had swans come and try to chase me away. Mustn’t venture too near their territory. 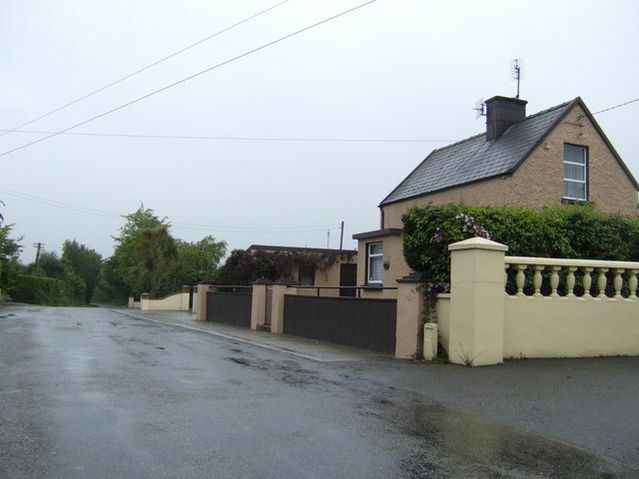 “The village of Forge, on the Urrin, about three miles from Enniscorthy, was established at this time, and in 1565 was the property of Colonel Robert Phayre. Jamesons whiskey clan, who are related to Marconi, stem from here. Hence shortened di[‘still’]ery version. Also, I remember my uncle Willie telling me of the Wilkinson Blades? connection. Forgelands or Fairfield comprises mostly of the farm. Daphne Castle (sadly) no longer exists. It adjoined Fairfield Farm. Marconi’s mother went off to Italy to train as an opera singer, hence encountering & subsequently marrying father to the inventor of the radio. There’s a small pond at Fairfield farm. The birds from pond flock to & fro, all the time. Behind trees to right, there’s a very old 10 acre forest, which acts as an enclosure to the farm. Marconi was born near Bologna, the second son of Giuseppe Marconi, an Italian landowner, and his Irish wife, Annie Jameson, daughter of Andrew Jameson of Daphne Castle in the County Wexford, Ireland. Monart is located in Wexford in over 100 acres of private woodland and their total focus is on helping guests to rest, rejuvenate and transform through a combination of its magical private location, luxurious facilities, excellent dining and worldclass spa facilities and treatment. A place to return to your true nature! Its 70 luxury bedrooms and suites, state of the art spa area, for use by both residents and day guests alike, world renowned products and treatments, and soothing yet sumptuous interior design will ensure an experience like no other in Ireland. It is the perfect location for the person looking to recharge and heal, for the couple looking for quality time and space, a group of friends seeking to re engage, or the company looking to reward or motivate somewhere more than a little bit different. Monart Spa Reviews and Photos, Enniscorthy, Ireland – TripAdvisor Enniscorthy – Wikipedia, the free encyclopedia Guglielmo Marconi‘s mother was Annie Jameson, the grand-daughter of the founder of Jameson’s Distillery. The location of the distillery, about two miles outside Enniscorthy is today known locally as “The Still”. These particular images by Tomek Bialek of Monart Spa are so utterly stunning. IN HIGHGATE Cemetery in London rests the remains of an Enniscorthy lady whose inspirational influence on the discovery of wireless telegraphy, though internationally known, has rarely been given the acclaim it deserves. The Enniscorthy connection with Marconi is well-known and is an important link with world history, but in this week’s column, we focus solely on the maternal Enniscorthy influence, that of his mother. She was, of course, Annie Fenwick Jameson Marconi, whose son, Guglielmo Marconi, born in Italy of a clandestine romance which bears the hallmarks of intrigue and melodrama, revealing also some of the strict conventions of the 19th-century Victorian era, pioneered one of the greatest achievements in the social history of the world. I second contents in article which states that there is nothing in the area to mark the passing of Annie Fenwick Jameson Marconi. Or Marconi for that matter. I think it’s absolutely disgraceful of Enniscorthy Co Council to ignore its past people with such monumental history. Daphne Castle was adjoining Fairfield on parts of land on opposite side of the road. I heard from neighbours a long time ago that the castle’s stonework was illicittly carted off to Galway or somewhere like that and used to build a cathedral. Wexford is one of the most friendliest Counties in Ireland. This is as a result of its history and location. It has the largest Ferry and Shipping port in Southern Ireland and as a result locals are no strangers to visitors. Enniscorthy is nestled in the heart of this wonderful County with its rolling hills and dales. It has some specacular views and these are located from the north to the south of this long land. In the north west of the County bordering Carnew, Wicklow and Ferns, Wexford I’d recommend Sliabh Buí (Yellow Hill) then across to Bunclody and the Blackstairs Mountains and in particular Mt. Leinster, which is easily accessible by auto-mobile. Back down to Enniscorthy and Vinegar Hill and travelling south to Forth Mountain and Carrig-Byrne. The southern coastline is worth a visit and in particular Nowth Head, Kilmore quay and Ballyhack. Lovely seafood restaurants are scattered around the coast with fresh catch a speciality. This is another photo of the Still looking out from Doyle’s Pub. There is a house directly opposite Fairfield farm. It has a half acre of land attached to it. It adjoins land belonging to Fairfield as it was once part of the farm. It was common practice in olden days for land to be compulsory taken off farmers by local authorities, if they so needed same to build houses for people. The latter were known as labourers cottages. I know that there were two brothers called White who lived in the house. I also see the name White in the census form above for 1901. I must look at it later on in more detail. A 1/4 acre of land was also handed over. It would be facing this house, (which is now owned by a lovely family). I think the family were called Murphy/Morrissey? The one-storied houses got an acre of land, whilst the two-storied houses got a half acre. I’m not sure as to why that happened. I was told that my mother gave a beautiful Christening gown to the family. It’s a story that I won’t elaborate on here. Fairfield Farm has two fields and a bit more sandwiched between this house and the once famous Daphne Castle. When one meanders into the centre of the fields there is such a glorious view to be had of Enniscorthy. It’s like being in another world it is that beautiful. There will always be good fertile land found where planter Protestants settled. This was told to me in good faith by an auctioneer, who should know what he was talking about. Just read that Monart Spa has won best spa in Ireland three times in a row. It has also been recognised as the second and third best spa in the world. Great achievement for Liam Griffin and group. Goldenbridge Industrial *School* lay adjacent to top left corner of image.